It has been possible to achieve phase-coherent operation of two I/Q data streams. It has NOT been possible to achieve phase-coherent operation on every run of the system. 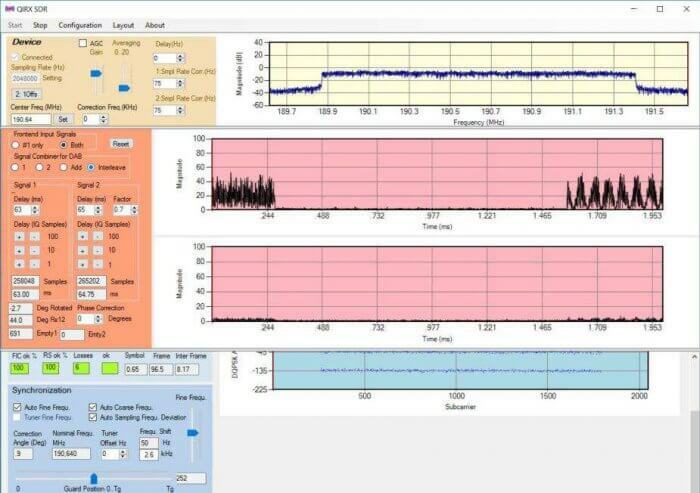 The system showed sub-sample time delay between the two receivers (if the interpretation of the observed behaviour is correct), varying randomly between different runs. A time delay of the two receivers sufficiently small for DAB demodulation of interleaved signals could only be achieved by pure chance. No attempts have been made to solve this problem during the experiments. The system showed varying phase differences between the two receivers, changing at a constant rate. Three different changing rates have been observed during the experiments. A working solution has been found for this phenomenon, consisting in an continuous permanent correction of the phase angles of every sample. This imposes a considerable enhanced processing load. The occurrence of three different relative phase angle rotation speeds seemed strange. With the lack of documentation any attempt to interpret this behavior seems pure speculation.